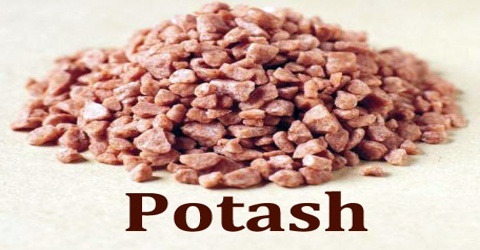 Potash is any of several chemical compounds that contain potassium, especially potassium carbonate (K2CO3), which is a strongly alkaline material obtained from wood ashes and used in fertilizezs. The term “potash” refers to a group of potassium (K) bearing minerals and chemicals. The compound, Potassium Chloride (KCl), is a dominating force in the world potash market. The name derives from pot ash, which refers to plant ashes soaked in water in a pot, the primary means of manufacturing the product before the industrial era. Potash is an important element because when there is a potassium deficiency in the soil, fertilizers containing potassium are used to help boost crop yields and improve the quality of the plant. 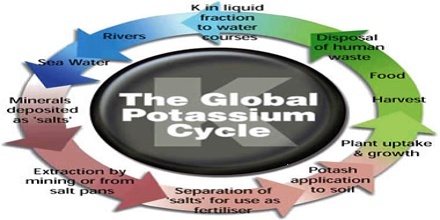 Potassium was first derived by electrolysis of caustic potash (a.k.a. potassium hydroxide), in 1807. 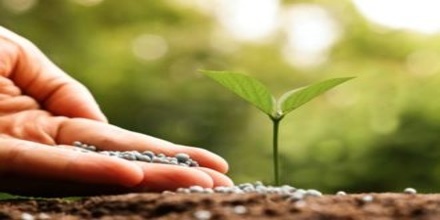 It is produced worldwide at amounts exceeding 30 million tonnes per year, mostly for use in fertilizers. Used in combination with nitrogen and phosphate (N-P-K Fertilizer), potash increases the yields of important crops such as: corn, soybeans, grains, and rice. The processing of potash ores by hot leaching with further crystallization of potash salt from saturated salt brines (halurgical method) began in XIX century in Strasburg. It is the 7th most common element in the earths crust. The primary methods of potash ore processing are flotation (mechanical method) and hot leaching (chemical method). 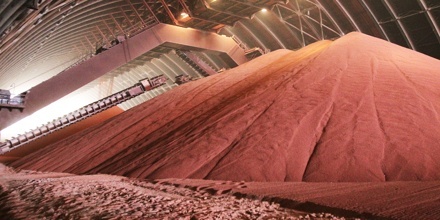 Potash ores are typically rich in potassium chloride (KCl) and sodium chloride (NaCl) and are typically obtained by conventional shaft mining with the extracted ore ground into a powder. Other methods include dissolution mining and evaporation methods from brines. The hot leaching method of ore processing is based on the physicochemical properties of NaCl-KCl-H2O system. The main principle of this method is the different temperature-depending degree of solubility of the mineral components – sylvite and halite: the high solubility of potassium chloride from ore by cycling solution at 115°C and the further crystallization of the valuable component on cooling. Potassium fulfils many vital functions in a wide variety of processes in plants, animals and man. It is typically taken-in in greater quantities than required and surpluses are naturally excreted. 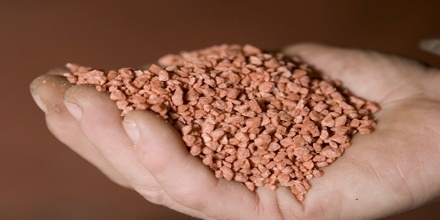 Potash contains soluble potassium, making it an excellent addition to agricultural fertilizer. It ensures proper maturation in a plant by improving overall health, root strength, disease resistance, and yield rates. In addition, potash creates a better final product, improving the color, texture, and taste of food. Another agricultural use for potash (potassium carbonate) is animal feed. Potash is added as a supplement to boost the amount of nutrients in the feed, which in turn promotes healthy growth in animals. As an added benefit, it is also known to increase milk production. An adult human requires around 2grams/day of potassium and typical intakes are 2.8-4.5 grams/day. Potassium chloride is important in many industrialized economies, where it is used in aluminium recycling, by the chloralkali industry to produce potassium hydroxide, in metal electroplating, oil-well drilling fluid, snow and ice melting, steel heat-treating, in medicine as a treatment for hypokalemia, and water softening. Potassium hydroxide is used for industrial water treatment and is the precursor of potassium carbonate, several forms of potassium phosphate, many other potassic chemicals, and soap manufacturing. Glass manufactures use granular potash (potassium carbonate) as a flux, lowering the temperature at which a mixture melts. Because potash confers excellent clarity to glass, it is commonly used in eyeglasses, glassware, televisions, and computer monitors. Potash (potassium carbonate) along with hartshorn was also used as a baking aid similar to baking soda in old German baked goods such as lebkuchen, or gingerbread. It is also used in brewing beer, pharmaceutical preparations, and as a catalyst for synthetic rubber manufacturing. Reference: pda.org.uk, kali.by, dictionary.com, feeco.com, wikipedia.